I can count on one hand the dishes in my repertoire that I consider staples, ones that I can confidently make without relying on a recipe. One of my ultimate goals in my quest to teach myself how to cook well is to have more of these go-to recipes stored away in my brain, and I'm slowly getting there. Baby steps! 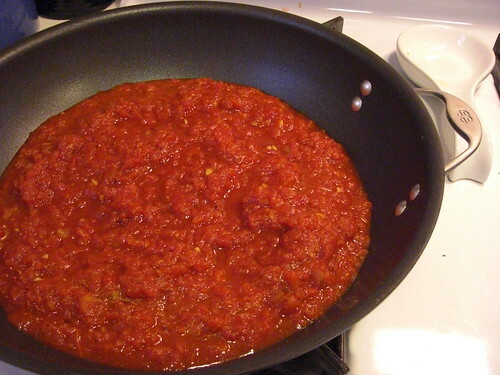 One that I keep coming back to is America's Test Kitchen's marinara sauce. It's actually part of their manicotti recipe (which I highly recommend), but I loved it so much the first time I made manicotti that I've been making the sauce on its own ever since. It calls for canned tomatoes, but tastes fresh and bright, which I love. I may or may not have been spotted eating this sauce like soup, that's how much I like it. This recipe is easily halved, and it also freezes well. 1. Pulse the tomatoes with their juices one can at a time in a food processor until coarsely chopped with pieces measuring about 1/4 inch (or to your taste) about 3 pulses, set aside. 2. Heat the oil, garlic and pepper flakes in a large saucepan over medium heat until fragrant but not brown, 1-2 minutes. Stir in the tomatoes and 1/2 tsp salt, and simmer until slightly thickened, about 15 minutes. Off the heat, stir in the basil, season with salt and pepper. Yes. I definitely, definitely, most certainly eat tomato sauce like soup. Often.